A truly unique, one-of-a-kind piece! 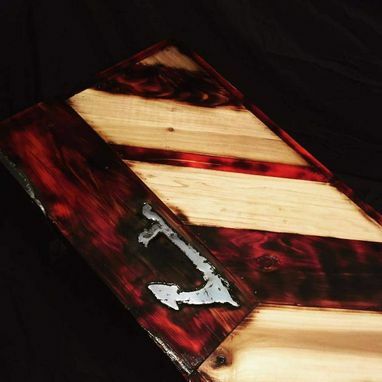 This table was born from the dreams of a grizzled sailor. While sturdy, it has the look of a piece of furniture that has been tossed about a Captain's quarters for many years and survived many battles. 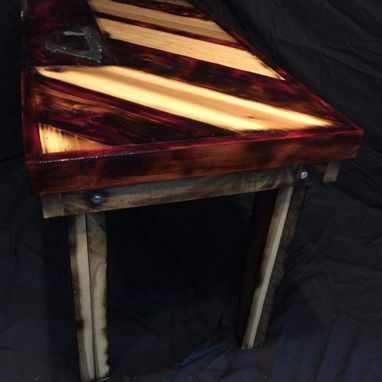 The construction of this table was pure manliness from start to finish. There are no tricks being played here or shortcuts being taken. 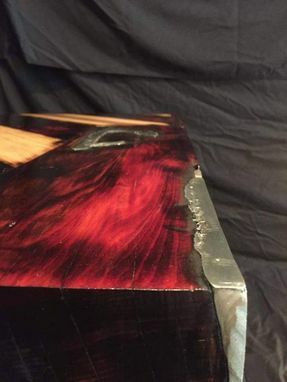 That is pure metal that was poured, in molten form, into the voids in the cedar slab. Then, after being ground down and shaped into the desired edges and anchor design, it was polished to a near-reflective surface but left pitted and weathered. The cedar and poplar top was then gone over with a torch that brought out the dimension you see in the above, unaltered photos. 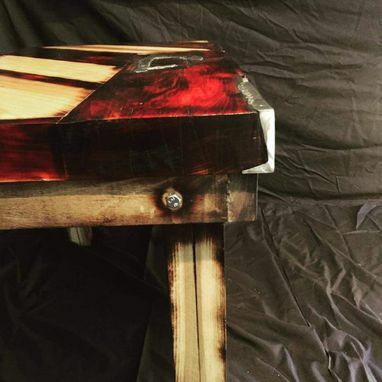 The legs were fashioned from the salvaged door of a 100+-year-old barn, bringing true age to a new piece. This beast is not exactly light, and the estimated shipping cost you might find on this page will not be anywhere near accurate. If you're genuinely interested in the piece, please contact me and I will personally check the price for you. NOTICE: Shipping charges on this page are not exact. Contact me and I will personally check the shipping rates for you.